In my earlier blog “Find undistributed replication command in SQL Server” I have exaplained the importance and usage of “sp_replmonitorsubscriptionpendingcmds” system stored procedure to find out undistributed command. If we execute “sp_replmonitorsubscriptionpendingcmds”, you may get undistributed command one time manually but I always try to capture important information in my monitoring application so that If there is any issue, it comes to notice of our support people and they can inform DBA team immediately. This is the requirement which triggered this article. Here is my requirement and logic I want to implement. I have one of the main production database (let us call this ProdDB) which is replicated to three different instance with same publication so we have three subscriber to ProdDB database. Out of these three databases, one database (let us call ProdDBSub1) is being used to display the report in our application which is being used by approx 12000 concurrent users. Higher latency or huge undistributed command will provide wrong information to the client which is not at all acceptable and this is why I have captured latency of replication in my monitoring application (Find the script here) and also captured total undistributed command in my monitoring application, if undistributed command number keeps increasing for long time and doesn’t decrease, our support team member immediately call DBA to look at replication. I have created one table in “DBAdb” database which has row for each publication/subscriber combination along with other important details. Each time I query “sp_replmonitorsubscriptionpendingcmds”, I used to store result in that table (update the current row only). I have this process in one SSIS package which is scheduled to run every 15 seconds . 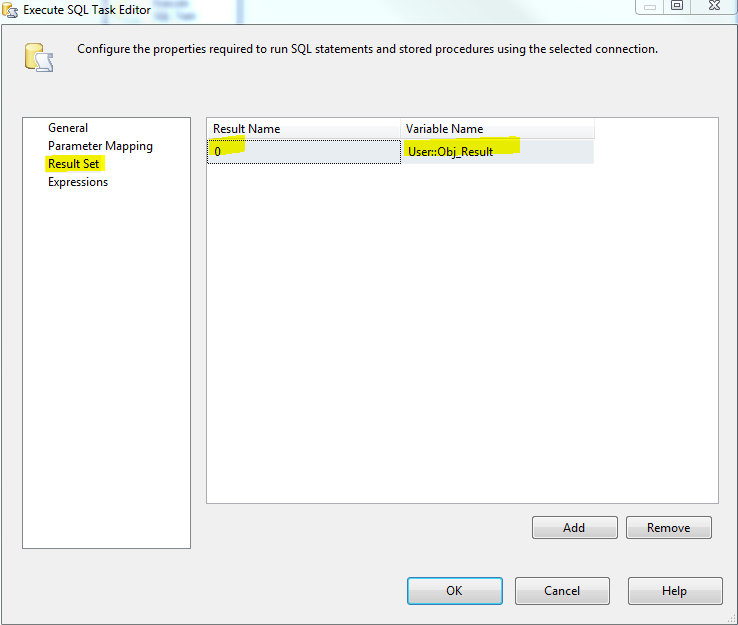 Let us create some foundation in SQL Server before we start creating SSIS package. --insert one record for your publication/subscriber. 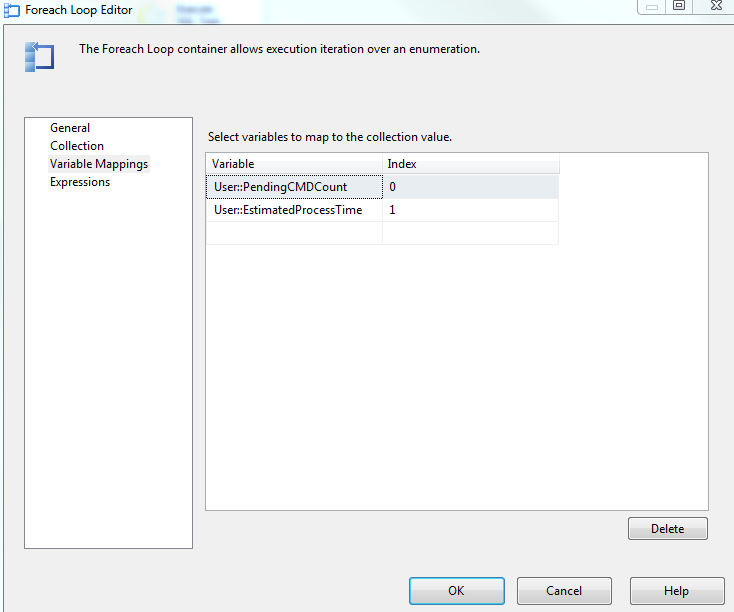 Now create one SSIS package and have three package level variable as shown in following screen capture. 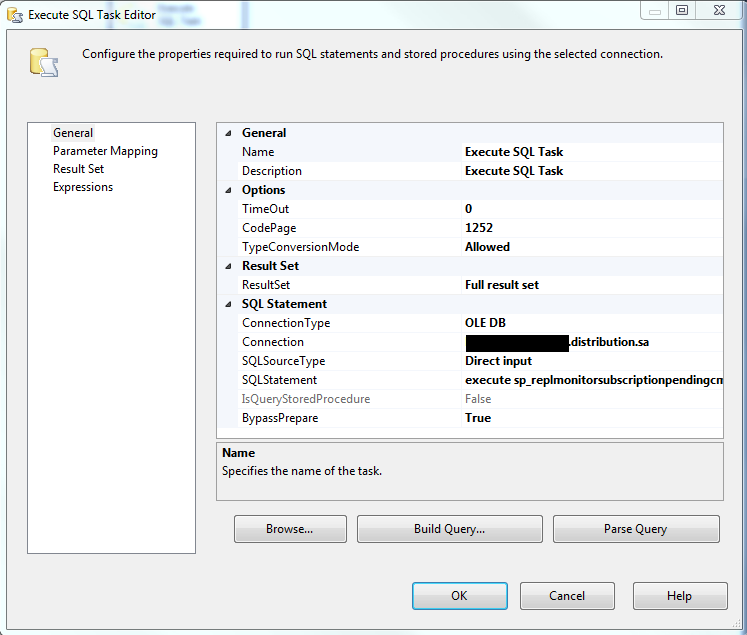 After having all three variables, take one “Execute SQL” Task in your package and use following query inside the task. System Stored Procedure “sp_replmonitorsubscriptionpendingcmds” will return result set and that should be mapped with one of the variable we have created above. Follow the screen capture. Please note that, I have had database connection of distribution database of replication for above given screen capture. Now, take one foreach loop container and iterate it with “Obj_Result” variable. 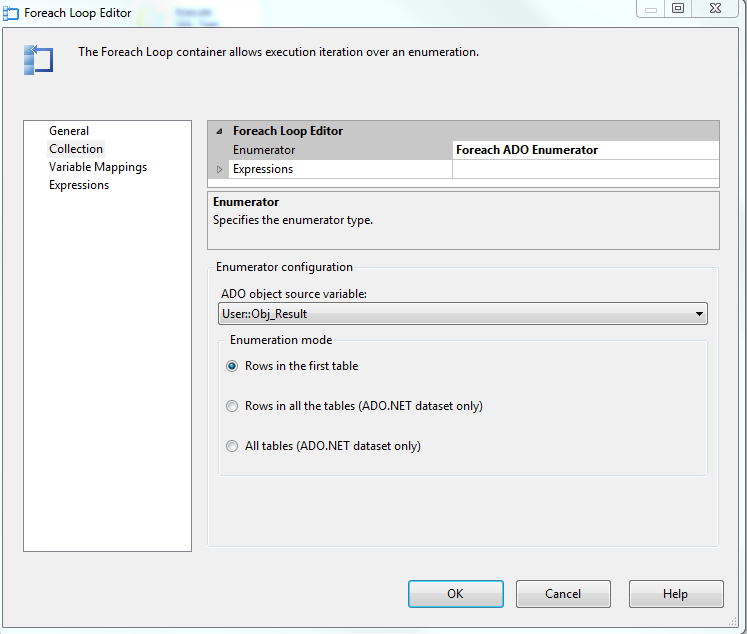 Now take one more execute SQL Task and kept it inside the foreach loop container. 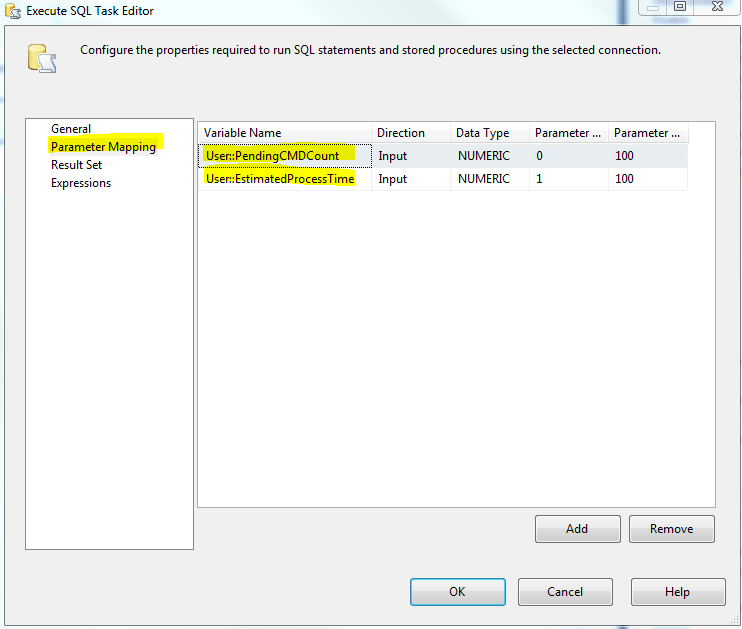 That “Execute SQL” task will have following query to update data in table. 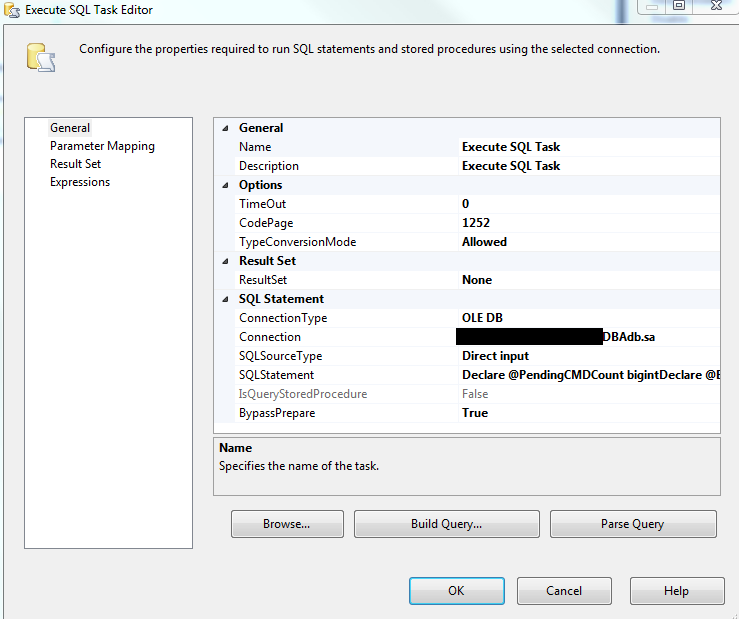 Please note that this Execute SQL task is having connection with “DBAdb” database and my “UndistributedCommand” table is there and data from this table will come to my monitoring application. 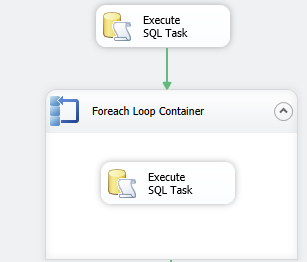 We have collected two valued in two different variable in Foreach Loop Container which we will pass to “Execute SQL Task” inside the loop. Now, you are having package ready to run. Execute this package from SQL Server Job or from Windows Schedule task via .BAT file as per the frequency needed for your business logic, I used to keep it at 15 seconds. Display the rows of “UndistributedCommands” in monitoring application, if you have, if undistributed command is >0. This entry was posted in replication, sql server and tagged replication, Replication Latency, SQL Server, Undistributed Command on March 15, 2013 by Riteshshah. I have written one article to find replication latency sometime back. If I find latency of 10 seconds or more for longer time then I always try to find the bottleneck and fix it because in the environment I am working, won’t afford big latency. In finding the bottleneck, my first step would be to find how many commands are pending to apply in replicated database. To find undistributed command, you can use replication monitor which comes with SQL Server itself or use “sp_replmonitorsubscriptionpendingcmds” system stored procedure which you can find in distributor database of replication. Here is the screen capture of output. This screen capture shows that total number of 64 commands are waiting to apply from “AdventureWorks2012” database to “AdventureWorks2012ReplDB” and that would take 0 (<1) seconds. I have written few more replication related articles, have a look if you are interested. This entry was posted in replication, sql server and tagged replication, Replication Latency, SQL Server, Undistributed Command on March 14, 2013 by Riteshshah. I have written article to find replication latency at “Find latency in transactional replication”. After reading this article, one of the blog reader put comment in article that they have transactional replication setup and if he runs the query given in my blog, he doesn’t get anything. Well, let me tell you that replication latency is being maintained neither in publisher database nor in subscriber database. Latency is being maintained in “Distribution” database so the query I have provided at “Find latency in transactional replication”, should be run in “Distribution” database only. Query given in article respond only if “Tracer Token” is inserted for the publication. You can insert “Tracer Token” from “Replication Monitor” but it won’t give you current status. You have to keep inserting tracer token and I used to do it from a SQL Server job which executes at every 5 minutes and insert new tracer token so that I can get latest latency. Here is the script which inserts tracer token from the script and that needs to call from SQL Server Job. --give your own publication name here. 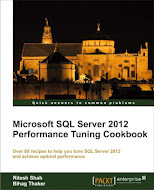 --my publication name is "AdventureWorks2012"
Execute this TSQL code in your publication database and enjoy the script given in “Find latency in transactional replication”. This entry was posted in replication, Tracer Token, Transactional Replication and tagged replication, Replication Latency, Tracer Token, Transactional Replication on February 23, 2013 by Riteshshah.